Parkersburg Police Chief Joe Martin, center, speaks during an early afternoon press conference Thursday detailing arrests during the drug sweep. 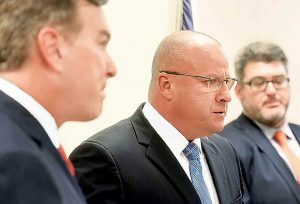 Michael B. Stuart, United States Attorney of the Southern District of West Virginia, left, and Parkersburg Mayor Tom Joyce listen. PARKERSBURG, W.Va. — The knock at the door at 6 a.m. was not a neighbor as members of the Parkersburg Narcotics and Violent Crimes Task Force (PNTF) along with federal agencies swept through Parkersburg residences, arresting 30 people and confiscating 150 pounds of methamphetamine, four pounds of heroin and approximately $86,000 in currency.